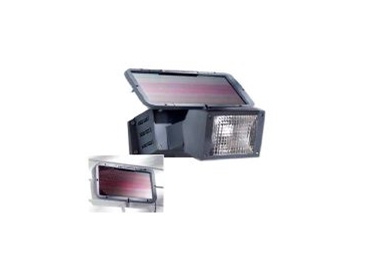 BR Marketing Services has released a solar floodlight, using 24 super bright LEDs to provide clear light sufficient to light pathways, driveways, entranceways and general areas, with a life of 100,000 hours. Powered by a rechargeable battery in a weatherproof housing, the fitting can be easily installed in any location without the need for wiring or mains power to be present. The battery is charged by the solar panel supplied with the unit, which comes with 12 feet of cable so it can be remotely mounted to allow it to be angled to catch the best sun. This feature can also be used to mount the solar panel out of reach to reduce the potential for damage or vandalism or to allow the fitting to be mounted internally. The Solar Floodlight can be supplied with a movement detector which senses movement within a 15 metre range and turns the light on. This turns the light into an effective security or safety light around buildings, yards, gates or sheds without the need or waste of lights burning all night unnecessarily. Dave Boreland, manager of BR Marketing Services, is confident this combination of technologies has applications with government departments, councils, farmers, campers, marine, shipping, commercial and domestic clients and is confident that importers, distributors, wholesalers and retailers will capitalise on the opportunities available to them and grasp this new technology. The solar floodlight has no maintenance costs due to the extremely long life of the LEDs, coupled with no electricity costs due to the solar panel.